What ball should I use? Angel Mines of Buffalo, NY writes: I’m really interested in becoming a LPGA player. I would like to know how you got started, and what exactly do I have to do to become a PGA member? I would like to know if you know of any agencies, trainers, schools, or fundings. Im 15 years of age and I think its time to start reaching my goal, and maybe with your help I can….Thanx. What a great inspiration to hear a 15 year old that is thinking about her future and has a goal to try to reach. First to become a player on the LPGA Tour is the simplest answer I can give. Study hard and keep up your grades is first and foremost. No matter how good you become as a player, you can’t play college golf if you can’t meet entrance requirements and stay in school once you get there. Secondly, dedicate as much of your free time as you can to practice, lessons, and playing golf to improve your technique in swinging the clubs and the putter. Third, learn how to shoot low numbers, physically and mentally. Learn to focus one shot at a time and do not be afraid of shooting a real low number. Start doing all this, go to college for more playing experience and try the Tour School. Second question. 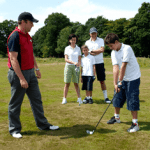 How do you become a PGA Professional with schooling, training and funding. There are more and more colleges and Universities offering the PGA of America Professional Golf Managemet Program (PGM) as a major at their schools. The first was Ferris State but now there are many others including New Mexico State and Mississippi State University. One of my young women students just started at MSU in the PGM program and is playing golf for the school on a golf scholarships. These schools also offer academic scholarships I believe. Each of these programs have requirements that you work the summers for a PGA Professional at a recognized golf facility. All the work you do in school and summers earn you credit towards your PGA Membership. For more information on the PGM program and the schools offering them, contact the PGA of America at the homepsge. It is http://www.pgaonline.com Good luck and I hope to be able to call you a fellow PGA member sometime in the future! Derek Hicks of Ottawa, Canada writes: I cannot keep my balance when using my woods on the “T”. I fall back or spin around on the ball. It doesn’t seem to happen with my irons either on the “T” or in the fairway. A good drill to learn the proper sequence, without the ball, is to stand next to a wall with the wall on your left (assuming you are a right handed player). Extend your left arm until your fingertips touch the wall. Put your left arm behind your back and take your right arm and try and touch the wall with your right fingertips without leaning towards the wall. First try by swinging your right arm only (no body movement that would get your body to face the wall) as hard as you can to try and touch the wall. You will probably miss the wall and knock yourself out of balance. After you prove to yourself that swinging your arms out of sequence with your body will knock you off balance and not even reach the wall, then you are ready to properly do this exercise. As you move into winter in Canada, find a Canadian PGA Professional who can suggest some drills to work on in your home to improve your technique for next Spring. Good Luck. Let me hear how you do! Mike Melena of Lakewood,CO writes: My club head speed is about 100 mph and I am a 9 handicapper, what kind of ball should I use? It sounds like you are on your way to building a great golf game. Today, the ball question becomes a little more complicated than in the past. My recommendations depend on weather conditions, course conditions and your ball flight characteristics. If you hit the ball normally high, you need to select a two piece ball with a low spin rate such as a Titleist DT 2 piece or a Maxfli surlyn covered as examples. If you normally hit the ball low, you would need a ball with more spin like a balata covered Maxfli HT or a Titleist Professional or Tour Balata. The best way is to invest a little money and experiment with balls. From a personal standpoint, I play either the Titleist Tour Balata or Titleist Professional in dry calm conditions and the Titleist HP2 Tour, Titleist HVC or Precept EV Extra Spin in windy conditions. Those are the balls I select to use depending on the day, course and conditions. The Tour players select one ball and stick with it. Corey Pavin plays the HP2 Tour, Davis Love the Professional, Nick Price and Ray Floyd the Precept EV and Nicklaus, Norman and Couples the Maxfli HT. These balls all match each players shot and ball flight characteristics and act best for them in the wind. 100 compression will always fly farther, 90 compression can give you some added feel. Experiment, good luck and keep bringing that handicap down. Mike Campbell of Detroit, Michigan writes: My problem is that I tend to slice the ball. It is a shot that starts to the left and comes around so that it finishes severely to the right of the target. I have checked my divots, and it appears that I am swinging the club on an outside to in plane. With my shorter clubs I usually get away with this, but with my long irons and woods I almost have no chance to hit the ball because I am coming down so steeply to the ball. Any help would be greatly appreciated. On the downswing, try and make your divots look right. Golf is a game of opposites. You see that with your current shots. You swing the club steep and to the left and the ball ends up right. You want to do the opposite now. Coming into the ball, you should sweep the ball off the ground and feel like your arms and club are swinging to the right of target through impact. Start with these tips. In Detroit there are plenty of great PGA golf professionals that can help you. Go see some and take a lesson until you find one you really like and communicate well with and stick with him or her and let him or her coach you in the fundamentals that will straighten out that slice and turn it into a hook. Once you do that, you are on your way to great golf. Marshall Baltzell of Aberdeen, SD asks: Today the high school started golf practice and they wanted every one to keep track of how they did. They wanted to know the number of fairways, greens, putts, ect. What exactly is the greens? Is it when you hit from the fairway and not the ruff? Or maybe is it how close you hit the ball to the hole on the chip shot? I’m not sure and I don’t want to look stupid to the coach. Scott Robbins: Marshall, your secret is safe with me. When coach wants to know how many fairways you hit it means how many of your tee shots on the par 4 and par 5 holes ended up in the fairway so that your approach shots on the par 4’s were from the fairway where it is easier to play from. When coach wants to know how many greens you hit it means how many greens did you hit “in regulation.” Par is defined as what an expert player should make on a given hole, considering the player uses two putts per hole. Therefore, an expert player should use 1 shot to reach a par 3 hole and 2 putts to make par; two shots on a par 4 to reach the green and 2 putts to make par; and 3 shots to reach a par 5 and two putts to make par. Hence the number of shots for the hole (1 for a par 3, 2 for a par 4, or 3 for a par 5) are the regulation shots it takes to hit a green by an expert player. So coach wants to know how many times in a round you can do that on average. By the way, of the greatest players in the world, the tour players, the leader in greens hit is less than 80%! Coach also wants to keep track of how many putts you have once your ball is lying on the putting green. This, combined with your greens in regulation (GIR) can be a good indicator of scoring. Keeping and using all these statistics can help you as a developing young player get the same information that the Tour player uses. Use these statistics and you will see what area of your game needs improvement and where to start working first. This is probably what coach is wanting to do. Good Luck. Work hard on your game. Study hard. Keep up your grades. Education always will take you farther, whether you have a great golf game or not. Jay Altringer of North Dakota writes: I am a pretty good golfer. I shoot a couple over par each round but I should be even lower. I will be cruising to a best ever round and then I will make a stupid mistake on an easy hole which usually results in a bogey. These mistkes kill my chances at improving my handicap. Why can’t I ever put together a consistent round of golf? Scott Robbins: Jay, What a great question and what a great lesson you can learn for yourself from golf about your every day life. The reason we can be “cruising to a great round” and blow it on an easy hole has to do with your focus. You can and should have a game plan for every round of golf you play. Your game plan includes strategy, shots to play according to how your swing is working and preshot routines. Once your game plan and strategy (and/or goal) is established and written down, then you execute your game plan ONE SHOT AT A TIME. When things getting going good or bad, focus on the routine you use to hit your best shots. Observe yourself and find that physical or mental key you use to focus you on hitting a good shot. Find the best routine for you and use it. There are a couple of authors (Sports psychologists) I suggest you obtain. One is Dr. Bob Rotella and my favorite, one of Dr. Rotella’s best student’s, Dr. David Cook. They will help with some great suggestions on staying in the here and now. Work harder at the mental game than you do at hitting practice balls. It sounds like you have that part down already. Good Luck. I’ll be watching for your name on the Junior circuits. Let me know how you are doing. John Lagel of Cambridge, OH asks: Is there a correct swing plane angle that I need to stay within? My father tells me that I am to flat on my swing plane and I need to get my swing plane on a higher degree of angle. Thank you very much for any help you can give me. Scott Robbins: John, Great question! Yes there is a correct swing plane you need to stay on. To hit the most solid, farthest and straightest shots your club must return to the ball where it started at address. Your swing plane will be dictated by your height and body structure. Once you are in the proper set up, your swing plane with your body will be dictated by your spine and shoulder tilt and angle. The shoulders should rotate around your spine and your back arm should hinge in the backswing and front arm in the follow through. Your plane at the top of your backswing should then have your forward arm parallel to your shoulder angle you set at address. Good Luck. See your local PGA Pro to fix that swing plane! Adriana Leenhousts of Dresden, Ontario, Canada writes: I am writing on behalf of my son – he asked me to do a search for him since he does not have an Internet Account. When he was 14, he took up golfing for fun. He became very good at it and developed quite an enthusiasm for the game. I took him to a local Sportsman’s Fishing and Golf Show. They had Pro’s available to critique a person’s swing. My son, David, hit some balls for him. The Pro walked over to me asked where David had received his lessons. I told him David had never had a lesson – that he picked up a club when he was 14 and started swinging. The Pro said that there was absolute nothing wrong with his swing and that he had alot of natural talent. By the time David turned 15, however, he got involved with a bad group of kids and turned heavily into drugs and away from everything else. Now he is 18 – has gone through rehab, counselling, etc etc. He is doing very well now. He has expressed a serious interest in golf again. Again, he picked up a club and started swinging. He routinely hits drives 250-300 yds and once in a while, even more. His swing is easy, rhythmic and natural. Our question is…… We live in a little hick town in Southern Ontario. Is there something we can do for him? It seems such a waste to see talent like this float away. There seems to lots of resources in the States – but do you know of any in Canada and anyone I can contact? an organization? David would appreciate any information you can send him. Thanking you in advance, Adriana Leenhouts and David Sherwood. Scott Robbins: Adrianna, Thanks for your inquiry. It sounds as if David is getting his life back together. Golf can be great for him to allow him to focus on the here and now. The only thing I can think of to suggest is try and find some information on the Internet about the Canadian PGA. If you cannot, go to the PGA of America home page and e-mail them and see what they can do about helping you contact the Canadian PGA. I am glad to hear of David’s recovery. Wish him the best and good luck finding someone and something convenient for him. Matthew of Tennessee asks: Do you have any clubs for sale? Scott Robbins: Matthew, I do not have any clubs for sale. Check at the local golf courses and off course shops for used clubs. If you are looking for something specific for you like a junior set, let these places know what you want and also consider runnning an advertisement in the newspaper. I have known that to work. Judson Weaver of Sulphur Springs, TX asks: What can I do to make my hook more of just a controlled draw? Scott Robbins: Judson, First of all congratulations on hooking the golf ball. That is the first step to becoming a better player. Some things to check to see the type of hook you are hitting. The first place is to check the divot after hitting an iron shot in practice. Is the divot facing left or right of target and is the outside or toe portion of the divot deeper than the inside or the heel portion. Is the divot flat and wide or narrow and thin. The next place to check is your driver. Are the tee marks moving from the center of the face to the toe or the center towards the heel. These will diagnose the problem early. First is your application of your hands to the club. They should be palm to palm with the club nestling towards the base of the fingers and the v’s between your forefinger and thumb on your left hand should point to your right eye or ear and the v on your right should match the left or preferably point at your chin. Your hands, palm to palm should be parallel to your clubface. The clubface square to target and hands parallel to the target line. Secondly check your posture and alignment of your body. A too inside path can be set up from an excessive lowering of the right (assuming you play right-handed) shoulder. The shoulders should be level, centered over the hips and the hands should be centered between your legs. Third, If your divot is too far right, try and slow your body down and let your arms swing towards your left leg. If your divots are to the left, try and slow your arms and speed up your body and swing your arms to the right of target. Try these while someone gives an eye (your dad or friend) to help. Best of all, find the nearest PGA Professional and have him/her evaluate and work with your golf swing. Good luck! Let me know how you do! Kevin Ray of Cedar City, UT writes: I need to find out the rules of golf for my scout group. Scott Robbins: Kevin, The actual “Rules of golf” published annually by the United States Golf Association (USGA) should be available at any golf course golf shop. There are also a couple more expensive books about the rules, one in particular written by Tom Watson, available at the regular bookstore in the Sports and Games section. If you go to a golf course with a PGA Professional, you might ask him or her if she might be willing to come to your scout troop and talk about the Rules of Golf at your meeting! Good Luck. If you cannot find a copy of the “Rules of Golf” write the USGA at Golf House, Far Hills, New Jersey 07931. Or call 1-908-234-2300.